GBPJPY eyes upside pressure on further corrective recovery as it retain its bull pressure. On the downside, support comes in at the 142.50 level where a violation will aim at the 142.00 level. A break below here will target the 141.50 level followed by the 141.00 level. 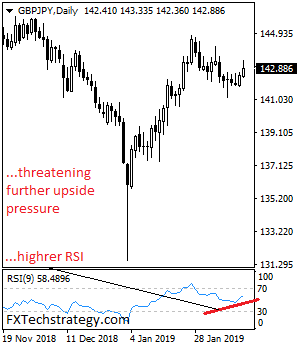 Conversely, resistance is seen at the 143.00 level followed by the 143.50 level. A cut through that level will set the stage for a move further higher towards the 144.00 level. Further out, resistance resides at the 144.50 level. All in all, GBPJPY looks to recover higher.